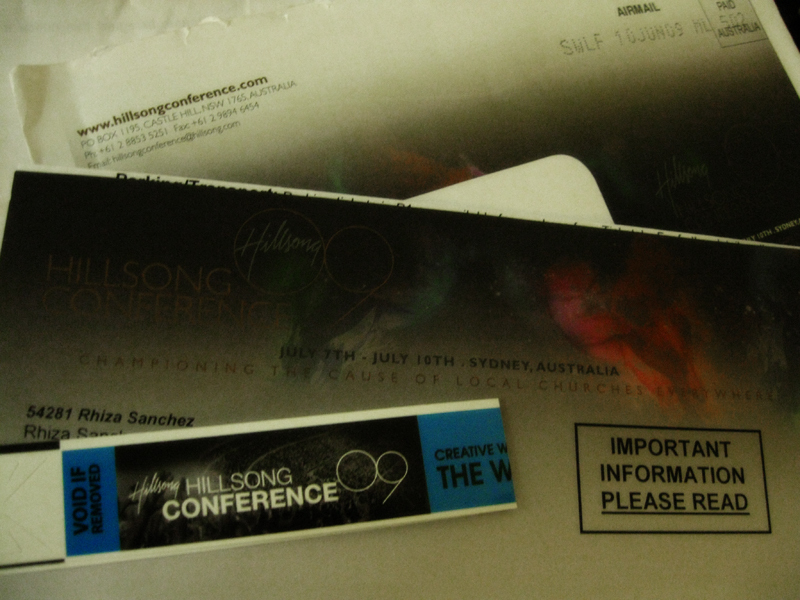 Today, my Hillsong Conference 2009 pass and registration receipt finally arrived at my doorstep. But unlike last year, I’m not jumping up and down now. Instead, I think I’m going to start tearing up when the lights are out. The conference is in less than two weeks. I have all the support documents that I need, but because of the recent events the caught me by surprise, my schedule got totally screwed and working on my visa application had to be delayed. Admittedly, there’s no one to be blamed but myself and my horrid habit of putting things off up to the last minute. I should’ve prepared my documents a month ago. But you know how God has a reason for everything, and how He always knows better. While I failed to attend the July conference last year, I was still able to see Hillsong last November. Now, holding this familiar-looking Hillsong envelop in my hands, I just can’t help but think of the big possibility that this conference pass will (once again) be put to waste. In my head I start re-counting all those plane tickets, concert tickets, and now, Hillsong conference passes that I spent for but never got to use. I could’ve bought a new camera with all that money! But okay, the unnecessary expenses was not the reason why I was sad to see the package delivered to me this afternoon. It’s just that, I find myself wishing I never laid eyes on it at all, you know, for the sake of not rubbing it where it hurts. I actually almost forgot about it already, and I didn’t want to be reminded! I have wanted so badly to experience the Hillsong Conference since 2003. I’m not about to linkback to all the blog entries I made all these years (from across 5 blog urls and 4 blogging platforms), but let me just say, I blogged and journaled everything about my quest to fly to Australia and experience Hills with a passion. Frustratingly, year after year, the timing was still not right. So yeah, let me wallow in depression just for, er, I duno, 11 more minutes I guess. I promise to be back to my sunshiney self as soon as I hit publish. Hey Riz, what are the documents that u lodged during your tourist visa application for the hillsong conference aside from the invitation letter? kelangan ba ng land title? pls. advice or e-mail me, thanks, God bless! Hi there, I was inspired by your blog here. I’m an addict fan of Hillsong because of their spirituality and amazing songs. If I were on your shoe, manghihina din ako. There are really unfortunate events that God allowed to happen because He wants to point out something to improve our faith in Him. Just like you did, cheer up! Truly God knows the prefect time for us. Great souls are tested with struggles and sacrifices. Be patient with the process. By the way, I’m also planning to go to Hillsong Conference this July. I’m currently gathering infos on how to apply for a visa. Anyhow, God bless to you!